Day 5 started with another fry-up, and the American couple on the next table had problems understanding the difference and precise nature of the offered ‘red’ or ‘brown’ sauce. The girl serving didn’t seem to know how to explain so she just repeated the choice … so I leaned over and told them that ‘red’ sauce is in fact ketchup, and ‘brown’ is HP sauce, or a spicier and fruitier version of ketchup. They declined both in horror, they seemed to think they were being offered hot sauces like peppercorn or gravy. We then ended up giving advice on their holiday – they were at a loose end because it was raining in Wales (well, duh!) – and of course we suggested a combination of Liverpool and Chester. They seemed very happy and excited when we left, they were busy hotel booking. I wish we had got their email so we could have found out how their holiday was. A warning for this stretch though: there really is nowhere to stop and eat, drink or rest. We knew that we had to bring food and water so I had a brainwave and asked the staff at Twice Brewed if they would sell us a cheeseboard portion to go and they did. Sadly the promised brie was not in the bag, but there was a chunk of parmesan(! ), nettle cheese and cheddar, crackers, chutney and butter. When we finally sat down to eat, suddenly flying ants came out of everywhere and we quickly packed up and left again. Luckily the Scouse Spouse had brought two bananas so we ate them on the go. 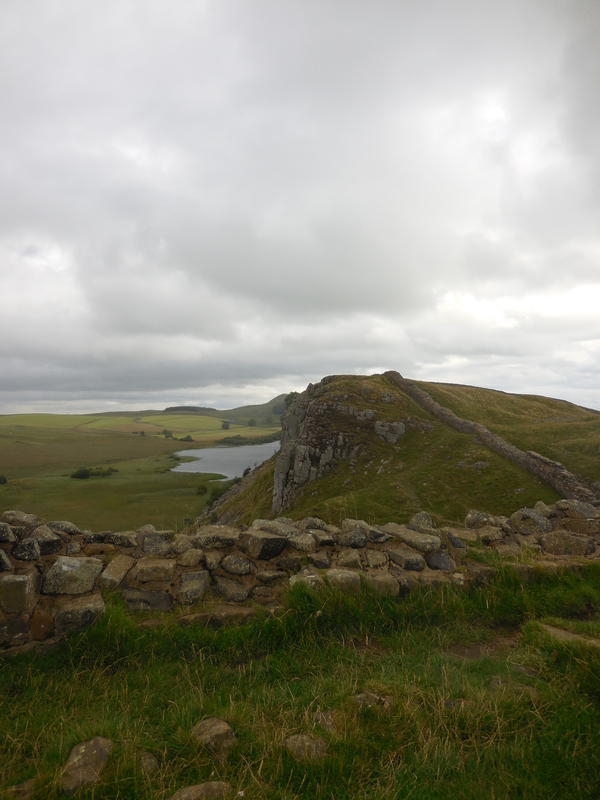 Actually there is a visitor’s centre at the Housesteads fort, but even though they sell hot and cold drinks and bottled water, there is no café as such. We were offered a blanket to sit on on the ground but decided to move on. Too many people, too much busy-ness, and I was not impressed that we couldn’t top up our empty bottles with tap water to use in the filter bottle. We did meet a NZ couple who had just walked the Camino Francés though, they started talking to us when they saw the subtle little things like our Camino forum patch, shell patch, shell bandana and shell buff. And then, suddenly, just below us as we came over another crest of another hill, there it was! 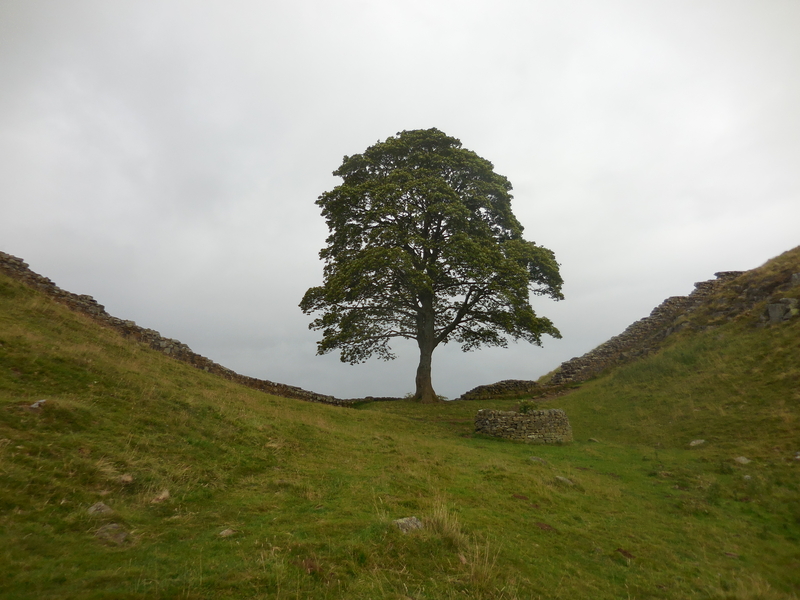 That Tree, aka the sycamore in Sycamore Gap. So photogenic. Looking back to the crags after coming over the last big one by the lake. 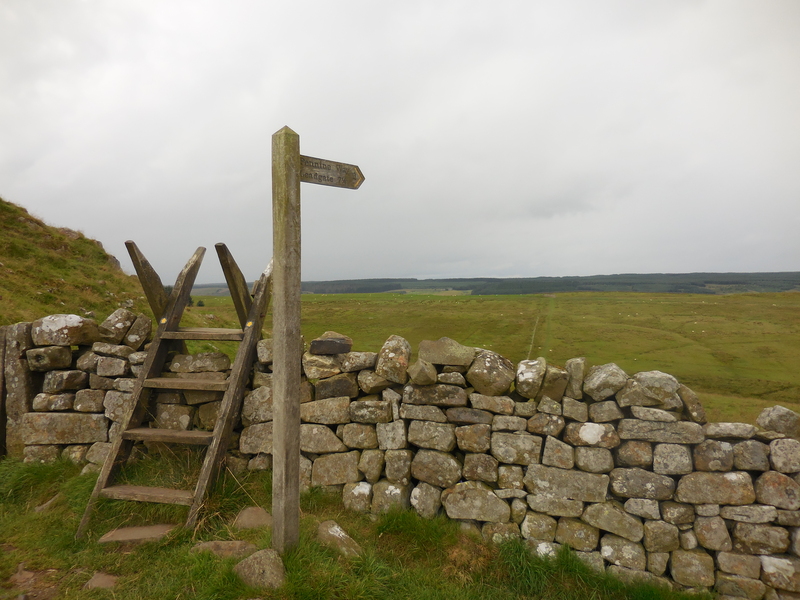 This is where the Pennine Way walkers leave the HWP and head North. As promised: That Gate. 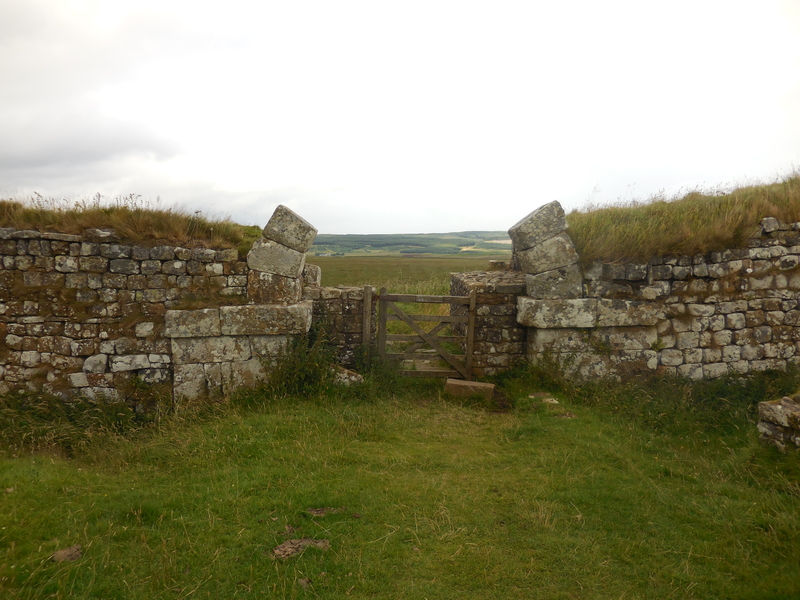 Apparently Hadrian drew up a very symmetrical and ordered plan which included gates at regular intervals, never mind if they ended up on a cliff edge, which this one does. No chance that any trader or cart will be getting in or out of there. But the awkward placement means it has been left more or less intact and not dismantled for building houses. And then my third highlight of the day: The Mithraeum! 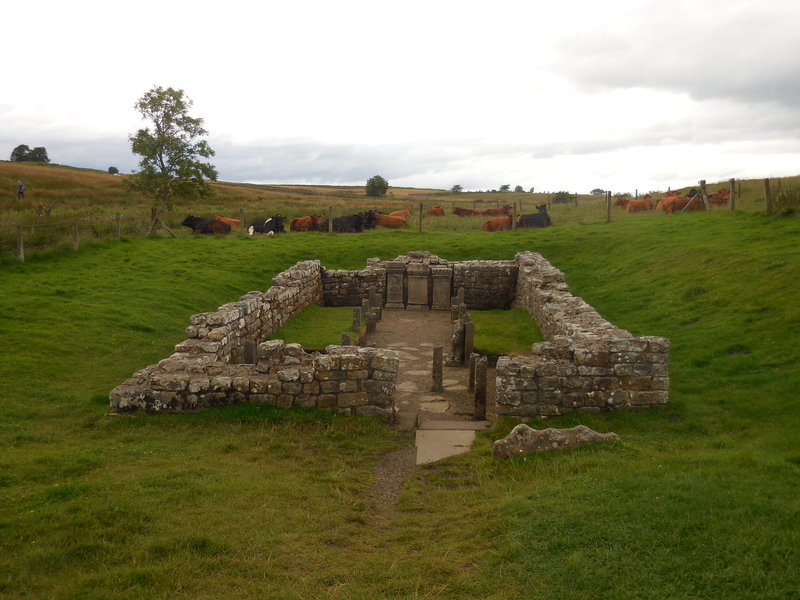 This temple was situated just by the military fort of Brocolitia, which is yet to be excavated. Getting around it was hard, as there was bog on one side and lots of bulls on the other, but the Scouse Spouse managed to get us close to it without suffering any damp or damage. For some reason the Mithraeum was the most powerful reminder of the age of the whole Wall for me, and history really came crashing down there and then. 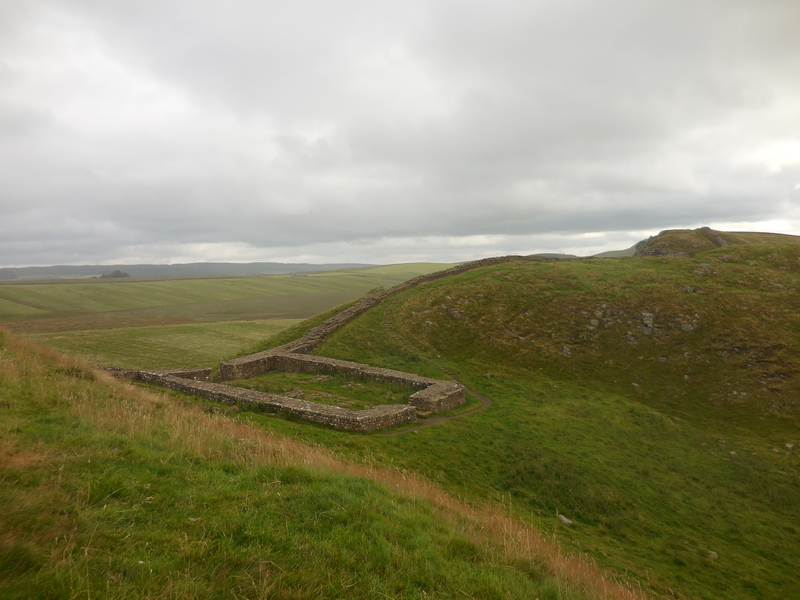 Which was one of the reasons why we decided to go to the Chesters fort museum and ruins the next day. There was no doubt the landscape was flattening again though. The path followed the road for a long while and was sloping slighly sideways, and the PF didn’t like it. At the end of the day, walking along the paved road on our way to our accommodation in the aptly named village of Wall, we were offered a lift by some walkers we had met earlier and who stayed at the same place as us, the Hadrian Hotel. 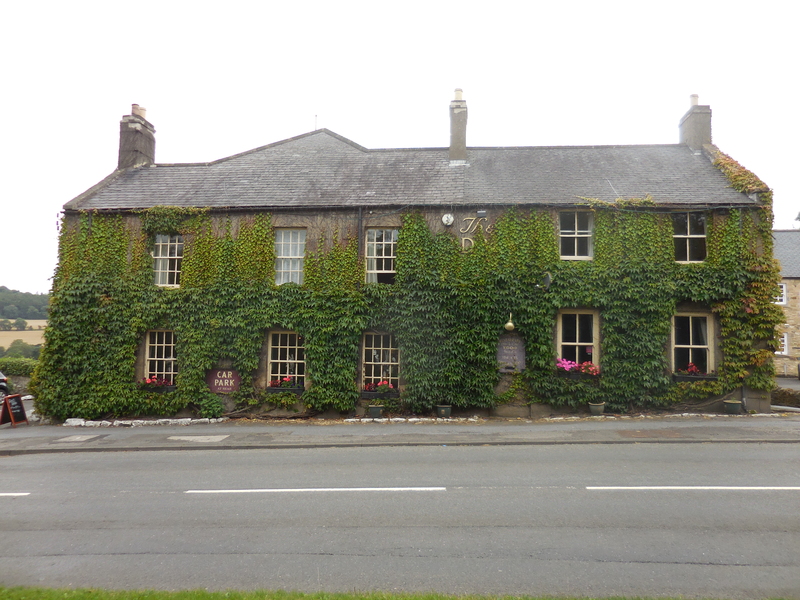 The hotel is more like a large and atmospheric B&B with lovely food – the chicken stuffed with haggis was on the menu again, with peppercorn sauce this time, and I jumped at the chance to try it! It was absolutely lovely, and plentiful, and we were very happy with our day. Haha, of course I walked it! It was pretty steep but there are stones like basic steps all the way to the top. I would rather walk up it than down it like the Conformists had to! 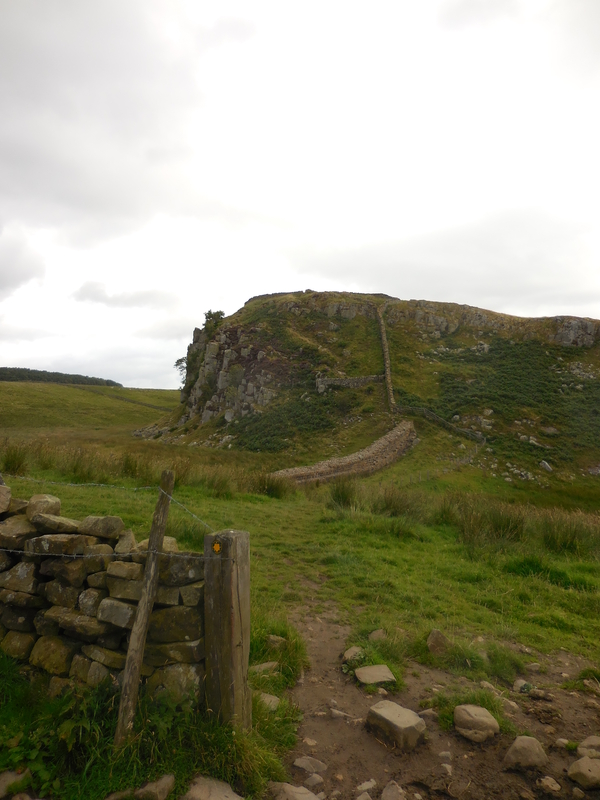 The path criss-crosses up the hill on the left hand side of the Wall in the first picture. Hard to see but you can make it out if you click on the pic – it is huge but if you zoom or move down a bit you can make it out.